As a chiropractor, one of the most common postural issues I see if my office is rounded shoulders. While many of my patients seek treatment for aesthetic reasons, others have neck pain and shoulder pain as well as shoulder blade pain because of their rounded shoulders and they’re looking for pain relief. The good news is that rounded shoulders can be fixed. This article is going to outline how to fix rounded shoulders with a few basic exercises and some simple workstation modifications. Disclosure: Some of this content uses affiliate links. Read our disclosure policy for more info. To begin, let’s get into a little bit of detail on what rounded shoulders are and what causes them. What Is Rounded Shoulders Posture? “Rounded shoulders” is a term that is used to describe the appearance of shoulders that are positioned further forward than normal. People that have rounded shoulders typically also have a forward head position and increased slouching of the upper back (thoracic kyphosis). This causes enormous stress on the neck and shoulders, which can lead to reduced shoulder range of motion as well as pain, numbness, and/or loss of function, typically of the upper body region. Sitting for extended periods of time in front of the computer. Texting on the cell phone (with head down). 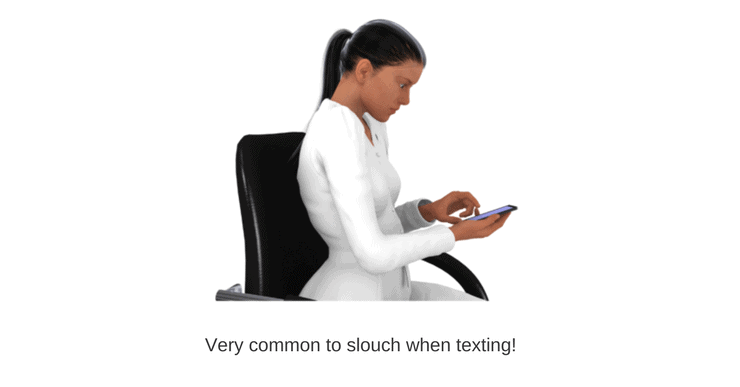 Driving for extended periods of time in bad posture. Stress response resulting in a holding or tightening of the chest muscles. Lying in a curled up position in bed. Excessive weight training (particularly of the chest). Cycling for extended periods of time. Adopting an awkward posture due to breast growth in teenage girls. There is usually an imbalance between the muscles that should be pulling the shoulders forward and the ones that should be pulling them backwards, to maintain a neutral posture. Let’s look at the specific muscles involved…. 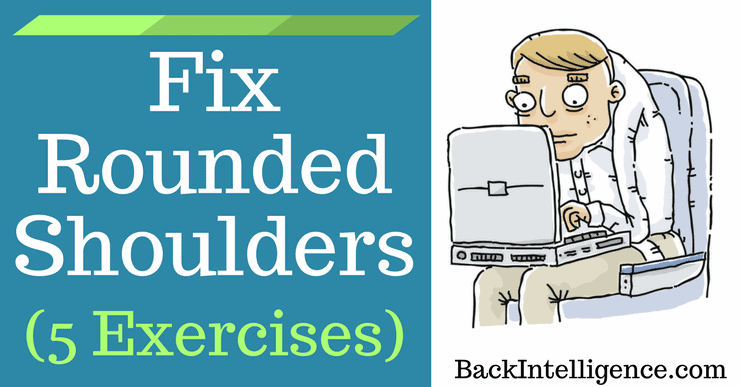 Now let’s look at how to fix rounded shoulders with exercises…. Incorporating these 5 exercises into your weekly routine won’t take a lot of effort and will help to correct rounded shoulders. I encourage my patients to perform these stretches 3 to 5 times a week for optimal results. You don’t need a lot of equipment. You can invest in an exercise band (such as a Theraband®) and a foam roller and you’re ready to get started. Because the abs and chest get super tight during sitting, the doorway stretch will help loosen it up. This will release tight pectoralis major and minor (chest muscles) that are usually very tight in rounded shoulder posture. – Grab the hook of the Theracane and position the knob in the grove just below your collarbone. – Apply downward pressure on hook to help release the trigger point. – Once you find a tight spot hold it there for at least 30 seconds. 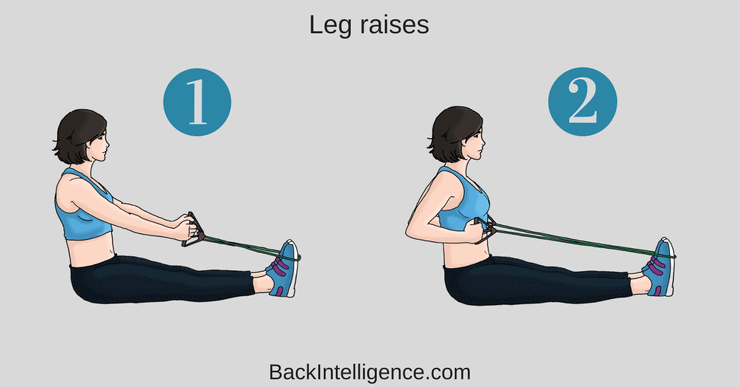 – Move the hook to apply the pressure at different angles to work the whole muscle. – Perform on both sides. This exercise strengthens the low trapezius muscles and serratus anterior AS WELL AS opens up the shoulders and chest. 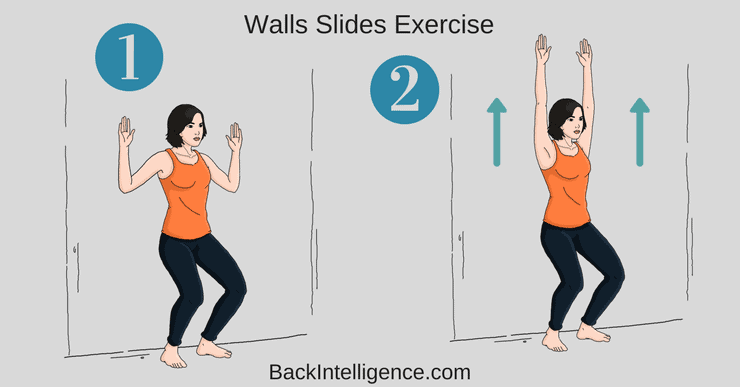 – Stand with your back to the wall and try to keep your upper back and buttocks in contact with the wall and walk your feet out about 12 inches from the wall. – Bend your elbows to 90 degrees, so that your hands are pointing towards your head, and try to press your forearms against the wall (this may be an uncomfortable position when you first start performing this exercise, don’t give up!). 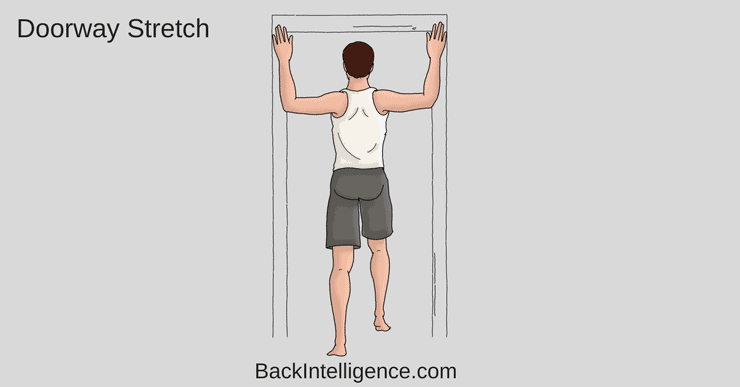 – Slowly slide your arms up towards your head and then back down the wall by squeezing your shoulder blades together. – Begin with 1 set of 10 repetitions and work your way up to 3 sets of 10 repetitions. This exercise strengthens all of the major muscles of your back, including the Mid Trapezius and the Rhomboids which will help bring the shoulders back. – Begin by wrapping your Theraband® around a stable piece of furniture. *if you don’t have a stable piece of furniture, you can wrap it around the bottom of your feet. – Hold the ends of the Theraband with your palms facing each other and extend your arms straight to get into the starting position. – Pull the ends of the Theraband® towards you as you bend your elbows and move them slightly behind your torso by squeezing your shoulder blades together. *be sure to keep your arms close to your body and avoid leaning forwards or backwards. – Stop pulling when your hands reach your torso. – Hold this position briefly before returning to the starting position by straightening your arms. – Aim for 3 sets of 10 repetitions. This is great way to loosen up the upper trapezius muscle that gets really tight from hunchback position. 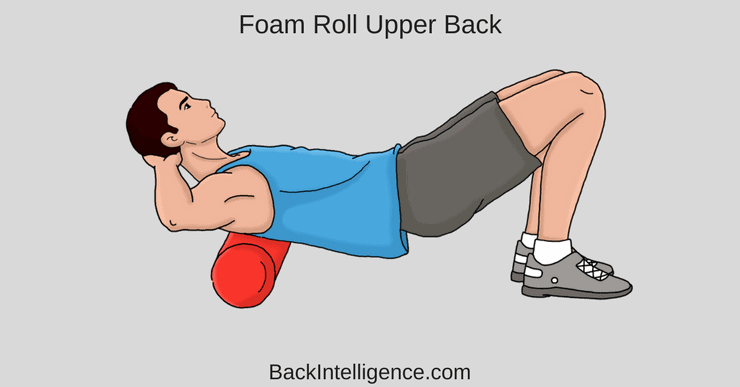 – Lie on your back, with your hands placed behind your head, and a foam roller placed under your upper-back. – Start to slowly roll up and down beginning at your mid-back and moving towards the top of your shoulders. – Pause for 15 to 20 seconds in areas that feel tight. – Repeat the rolling on any areas of tightness. If you work a 9 to 5 office job, you’re likely spending the majority of your day sitting at your desk, which may be contributing to your rounded shoulders. Setting up your workstation in an ergonomically friendly way is essential for improving posture and helping to correct rounded shoulders. The better your posture is while you’re at work, the easier it will be to prevent and correct rounded shoulders, so put some thought into the design of your workstation. – Ensure that your chair is positioned so that your thighs are perpendicular to your calves, with your knees bent at a 90 degree (using a footrest can help to achieve this position and minimize strain on your back and shoulders). – Ensure that your upper body is aligned with your head resting above your shoulders (not in a forward flexed position). – Ensure that the upper part of your computer monitor sits just below eye level (lower monitors will encourage you to hunch forward as you tilt your head to see the screen and promote rounded shoulders). – Take regular breaks to walk around and stretch out your neck and upper back. If you suffer with rounded shoulders you may not like the way you look, or you may be suffering with neck and upper back pain. By performing the exercises mentioned in this article and modifying your workstation, you can now fix your rounded shoulders posture. Fix your Rounded shoulders & Fwd Head posture, get out of pain and increase your mobility.